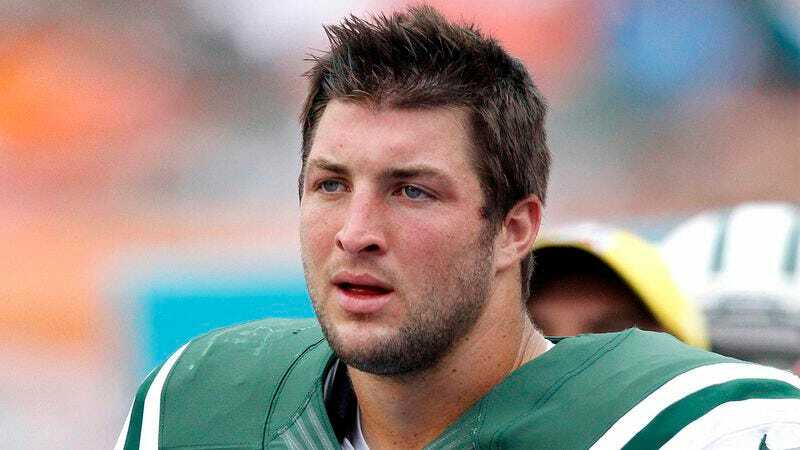 NEW YORK—Following his release from the New York Jets, NFL quarterback Tim Tebow told reporters Monday that at a moment of distress and confusion such as this, he is unsure who to turn to. “At times of uncertainty, it is sometimes not immediately obvious what the league has in store for you next,” said Tebow, adding that though he is frustrated with the lot he has been given, it is not his place to question the will of the Jets’ front office. “Even in this, my darkest hour, I can take comfort in the existence of a higher power who will protect me and take me in, such as [Chicago Bears general manager] Phil Emery. Or perhaps the big man upstairs, [Dallas Cowboys owner] Jerry Jones, holds the key.” Though Tebow emphasized that he remains unsure of what purpose the league has for him, many football analysts said they expect the quarterback will ultimately end up walking in the healing light of the Canadian Football League.